Breguet made history with the Classique Chronometrie Ref. 7727, the first wristwatch on the market with a magnetic escapement. Breguet unveiled the Classique Chronometrie 7727 in 2012, becoming first to market with a mechanical timepiece using magnets for the escapement. The concept is simple: tiny magnets on each endstone of the balance staff keep it in place, pulling it back upright when the balance is displaced by shocks. Where large balance wheels, overcoils and free sprung balance wheels were the norm in historic attempts to improve chronometry, the Classique Chronometrie is a distinctly modern approach. Magnetism has historically been a problem for mechanical wristwatches. Once magnetised mechanical timekeepers typically run very fast, or stop complete in severe instances. Breguet’s sister company in the Swatch Group, Omega, tackled the problem head-on with the Master Co-Axial movements which are practically immune to magnetism. 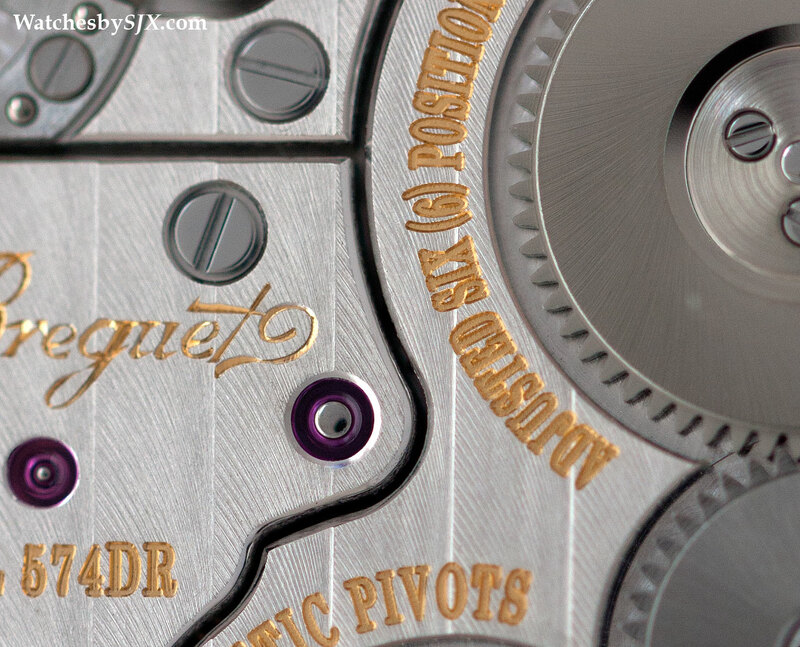 Breguet, on the other hand, has incorporated magnets into the escapement to achieve remarkable timekeeping. Though not the first watch with a magnetic escapement, TAG Heuer used magnets to replace the balance wheel in the Pendulum concept watch in 2010, the Breguet Classique Chronometrie was the first commercially available wristwatch with magnets in the movement. 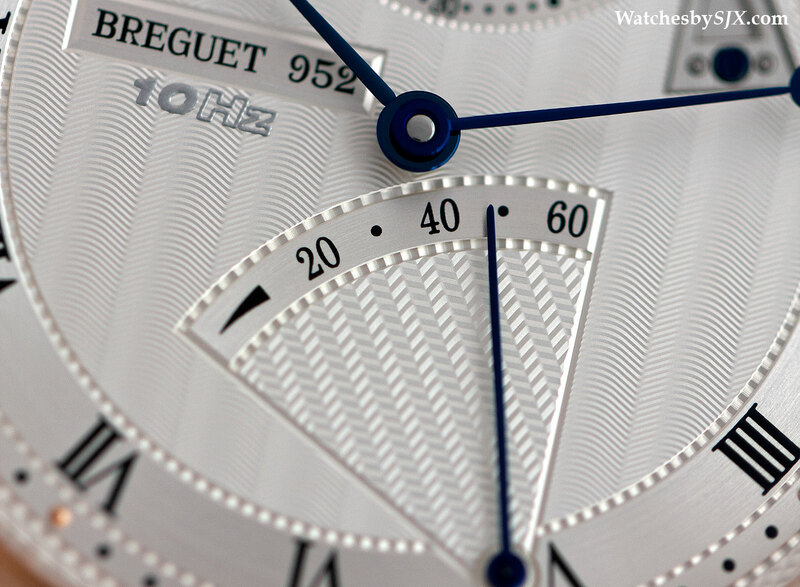 Patented in November 2010, the magnetic balance of the Breguet Classique Chronometrie Ref. 7727 is secured with two tiny magnets, each behind a conventional ruby endstone. On the dial side the magnet is more powerful, keeping the tip of the balance staff constantly in contact with the endstone. A less powerful magnet on the other side keeps the balance staff in place, but hovering over the endstone with no contact at all. The magnets function as a sort of anti-shock device: the balance staff is kept in place even with mild shocks. Only powerful impacts knock it out of position, but the magnets bring it back into place almost instantaneously. This means the oscillations of the balance wheel are more stable. And because the magnets keep the balance staff suspended in an identical position regardless of the position of the watch, so the friction on the pivots is constant all the time. In a regular wristwatch the vertical position tends to cause the most friction due to the weight of the balance wheel pulling downwards. 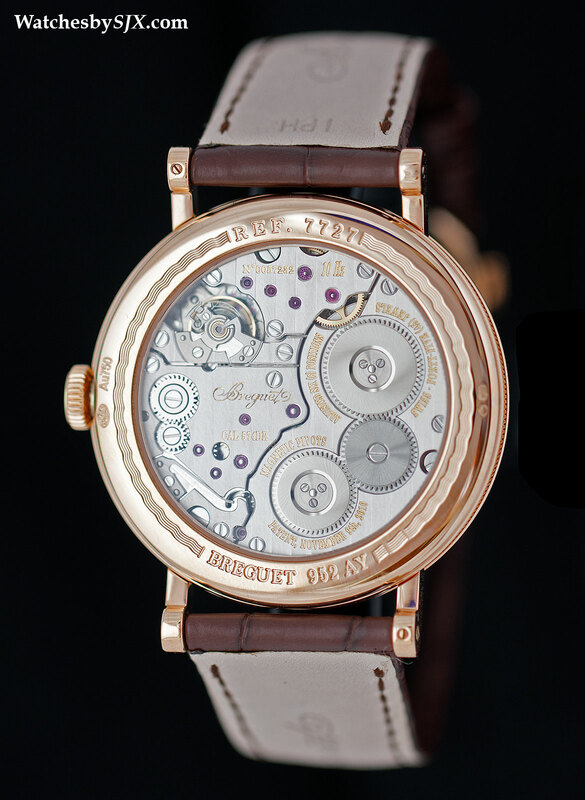 Alongside the magnetic balance pivots, Breguet also outfitted the Classique Chronometrie with a silicon escapement. The escape wheel, pallet fork and hairsprings – there are two balance springs – are all made of silicon. 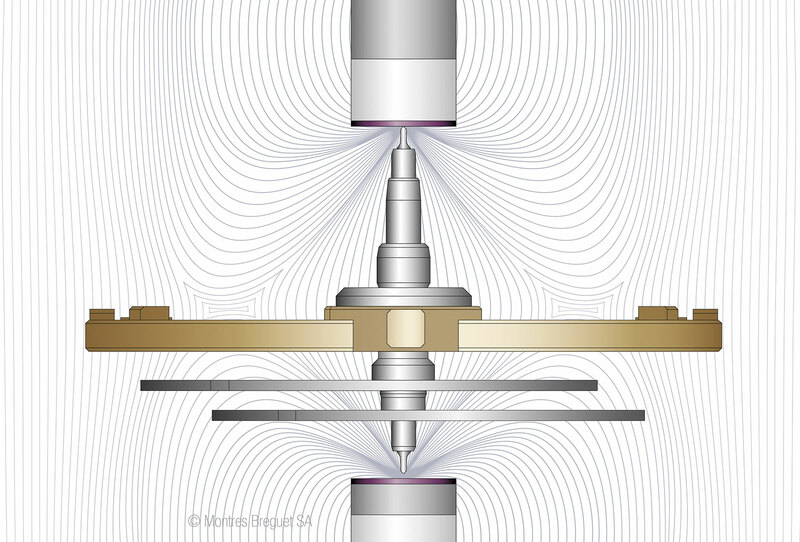 The twin hairsprings work in opposite directions, breathing more concentrically than a single hairspring and improving the stability of its oscillations. 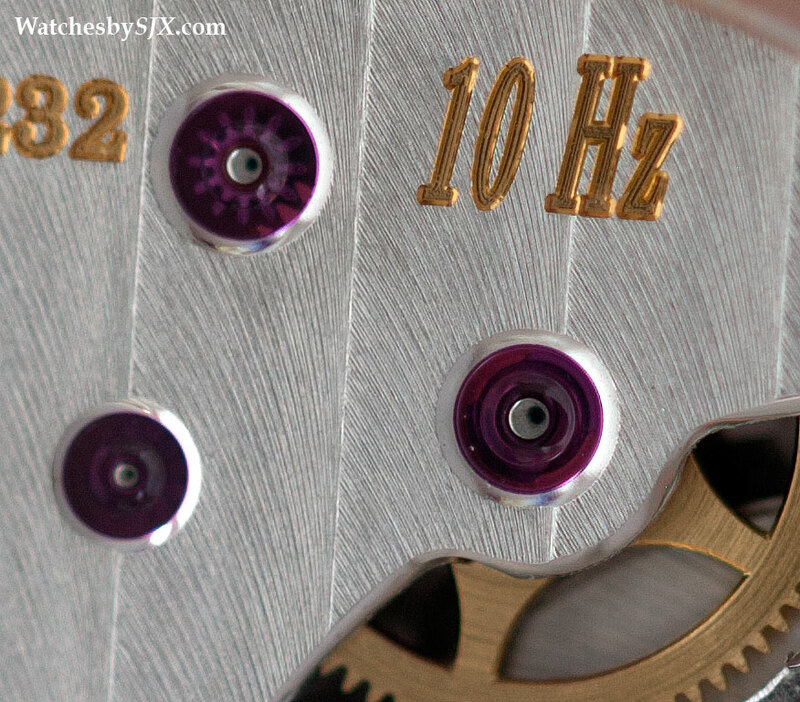 The material’s usefulness in watchmaking is well known. Silicon is non-magnetic, lightweight, nearly frictionless and can be manufactured precisely in large quantities. Silicon’s low coefficient of friction allows the movement to run at 10 Hz, or 72,000 beats per hour (bph), some two and a half times the frequency of a typical movement. A higher frequency means greater inertia in the balance wheel, and consequently more stable timekeeping. That, along with the magnetic balance pivots, mean the Classique Chronometrie is able to keep remarkable good time, to between -1 and +3 seconds a day on average. That is considerably superior to the mass market COSC certification standard of -4 to +6 seconds, or even the more stringent -3 to +5 seconds of Grand Seiko. To remind owners how well it keeps time, each Classique Chronometrie is delivered with individual test results for that particular specimen. 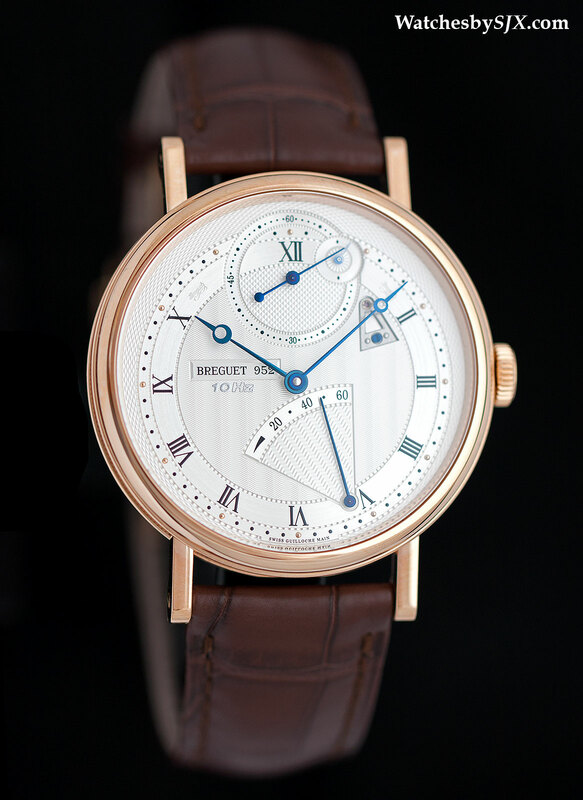 Despite the high-tech movement, the Classique Chronometrie is typical Breguet in style. The case is slim, with soldered lugs and a fluted case band. At 41 mm in diameter and 9.65 mm high, the Classique Chronometrie Ref. 7727 is large but slim, with good proportions on the wrist. 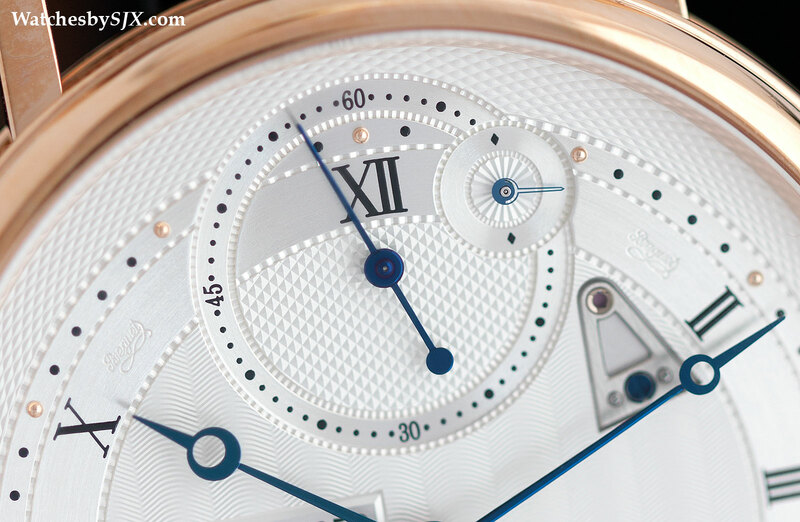 As expected from Breguet, the guilloche dial is beautifully done. Six different guilloche patterns decorate the silvered, solid gold dial, which is ever so slightly off-centre, closer to six o’clock than it is to 12. The main seconds hand is at noon, with a smaller tenth of a seconds register at one o’clock featuring a skeletonised hand that makes one round every two seconds – a frantic pace that gives an otherwise sedate dial some life. And it also provides a striking contrast with slow pace of the regular seconds hand. 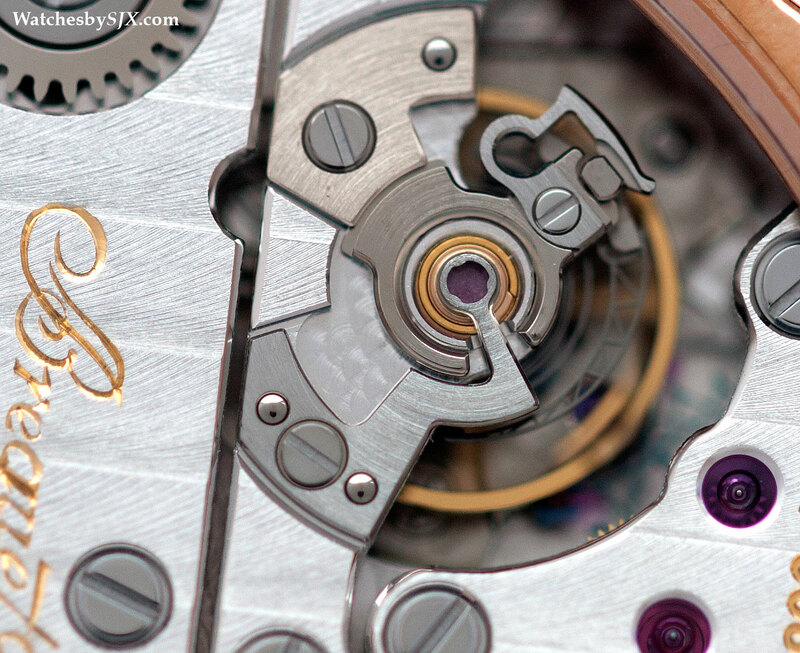 Because it travels one round every two seconds, each half of the tenth of a second sub-dial is equivalent to a second. And the skeletonised hand moves in almost imperceptible steps of 1/20 of a second as it’s linked directly to the escapement running at 72,000 bph, which works out to 1200 beats per minute and 20 per second. At six o’clock is a fan-shaped power reserve indicator – the movement runs for 60 hours – and at two o’clock is a cone-shaped steel plate to secure the dial-side endstone of the balance. The cone-shaped plate is a reference to the similarly shaped end of the pare-chute shock protection spring invented by Abraham-Louis Breguet in the 18th century for his pocket watches. 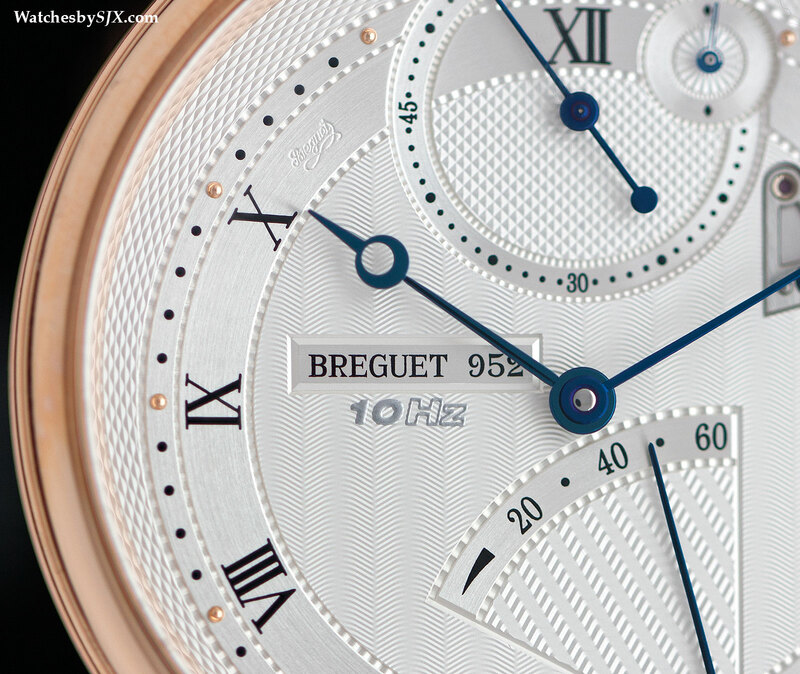 Unfortunately, Breguet decided to print an Italicised “10 Hz” just below its logo on the dial. While it is in a mid-grey colour and not exceedingly obvious, it looks unattractive and out of place. The movement is well decorated, appropriately for a watch of this price. But it is laid out in a very 21st century style, with bridges close together, nearly edge to edge, revealing little of its mechanics. The form of the bridges are also clearly the product of CNC machining, with the rounded, squiggly lines possible only with that technique. The Classique Chronometrie is available in rose gold or white gold. Prices are 58,000 Singapore dollars (~US$46,400) for the white gold model, and 57,400 Singapore dollars (~US$45,900) for the rose gold. In the grander scheme of things that is a reasonable sum for a high-tech chronometer.